Is Butter A Carb? began airing in October 2016 on XRAY FM. The brainchild of everyone's favorite dynamic duo (Megan Hattie and DJ Mami Miami), the show takes questions from listeners both in advance and live on air. We dish sweet and wise advice plus some tunes in response to each question/topic. We're working on archiving our episodes, so stay tuned and check back here for more info. You can follow us on Facebook here. 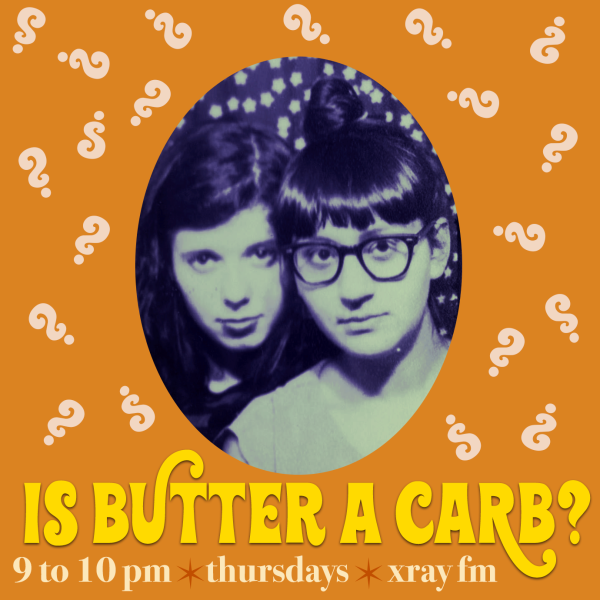 Send us your own questions to IsButterACarbPDX@gmail.com or leave us a voicemail at 937-343-5787 and hear us answer your questions on air. Catch us every single Thursday night from 9 - 10 PM PT. Megan Hattie presents: Portland's Funniest Semi-finalists Neeraj Srinivasan and Amanda Lynn Deal! Friendship pt. 3: Internet Friends & Pen Pals! Food Pt. 4: Guest Lida Husik!